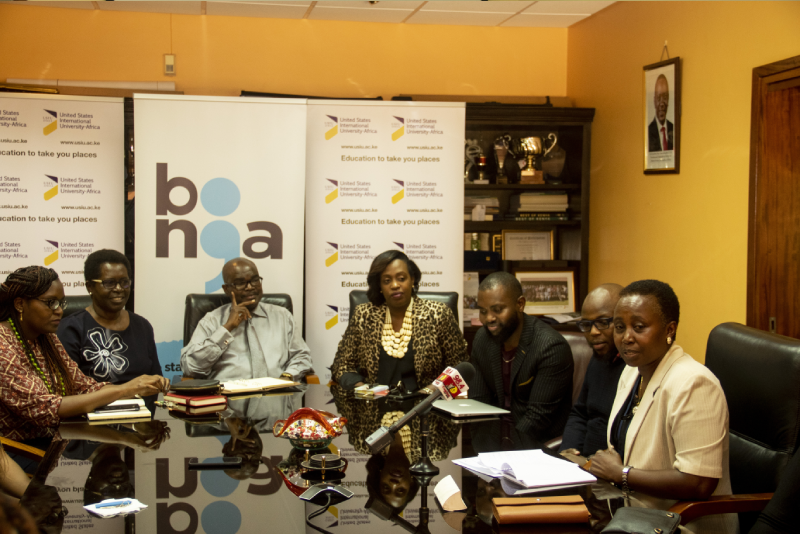 On Thursday, January 31, USIU-Africa and Capital Group Ltd signed a Memorandum of Understanding to assist people with their mental well-being through the Bonga Initiative (a platform created by Capital Group Ltd). The event held at the Vice Chancellor’s Boardroom was attended by the Vice Chancellor Prof. Paul Zeleza, DVC Academic and Student Affairs Amb. Prof. Ruthie Rono, Capital Group Ltd Managing Director Omoina Kimojino, members of faculty from the Department of Psychology and other members from Capital Group. Bonga is an initiative to encourage people to open up and be more honest about their mental well-being. It is a safe space where people can share their feelings anonymously without fear of judgement, and empathize with others going through stress and mental conditions like depression, anxiety disorder and bipolar disorder. Through this partnership, USIU-Africa students, faculty and established alumni will be able to offer expert counsel to Bonga platform users while Capital Group Ltd. will offer brand awareness and association especially to the Psychology Department, extend branding on the web platform Bonga for USIU-Africa counselors as certified professionals affiliated with USIU-Africa and access to various cases, highlighting new areas for research and data collection on mental illness in Kenya. This partnership was spearheaded by Dr. Josephine Arasa (Associate Professor of Psychology & Ag. Chair, Psychology Department) and Ms. Ivy Mangeli (a psychology Alumni and Bonga/Capital group staff). This comes months after USIU-Africa in partnership with Blaze and DW communications held discussions on Mental illness at the auditorium. The university continues to put in place measures to ensure that mental health is observed and treated with importance.